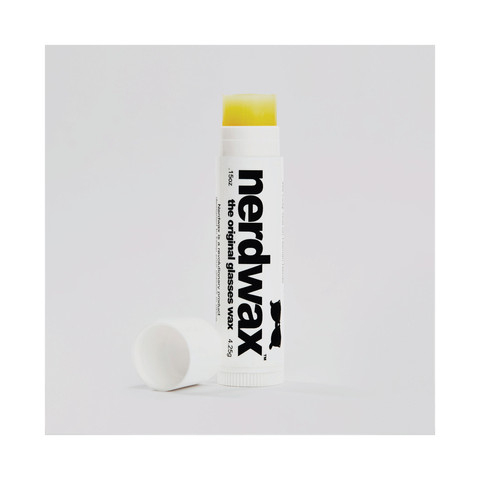 A few weeks ago, thanks to a tip from one of our customers in the US, we found out about nerdwax… “a beeswax based blend of all natural and certified organic ingredients specially formulated to keep your glasses in place” that’s made in the USA. Initially pitched as a ‘you should make this’ idea, I looked into it and concluded that there was no way we could improve on what is already being done. These guys have nailed it… not only with the beeswax base and the ingredients, but their packaging is clever, their marketing is great and it’s another small business started on a stove top. Long live small businesses started on stove tops! It arrived yesterday morning. We got to give it a very thorough testing in the 38 degree Sydney heat yesterday and it was given an enthusiastic thumbs up with our first 5 tubes sold! So, what’s nerdwax? We couldn’t describe it any better than Don Henjy the inventor. Here he is! We’ve got Nerdwax available as single tubes and a bundle of 3 tubes. At Queen B, we delight in making the world’s purest beeswax candles. Our pure beeswax is carefully sourced from beekeepers we know personally and then cleaned thoroughly over 72 hours. Our wicks are pure cotton and we scour the globe to ensure we are always at the forefront of wick technology. Our range extends from the basics (beeswax tealight candles, beeswax tapers, beeswax dinner candles, beeswax pillar candles), to the innovative (beeswax jam jar tealights, Burning Love, Ecobulb) and through to more designer beeswax candles(our rolled pillar candle ranges). We’re having a party! Why? Because somewhere along the line we had our 10 year anniversary without really celebrating it and because, truth be known, I’m happiest in a candle lit hive, filled with our favourite people and other kindred spirits, cooking up a storm and serving great Australian drinks. If you’ve ever wanted to be in the company of a group of similarly extraordinary people, here’s your opportunity. This is what we look like with our party frock on! Bookmark this seasonal table decoration idea under “simple but brilliant” for your next dinner party or event… seasonal branches down the centre of the table with little clusters of beeswax Jam Jar Tealights interspersed along the table. And for the dessert table… stacked wheels of cheese! Hopefully in amongst that abundance there was raw honeycomb with honey dripping from it. It’s my cheese platter secret and is a source of much delight and childhood reminiscing. Now that’s what i call dessert! Special thanks to our customers Clare & Hayden, to Love Katie and Sarah for the photographs and to Cecilia Fox for the beautiful florals (and for introducing Clare & Hayden to Queen B’s pure bee created light). 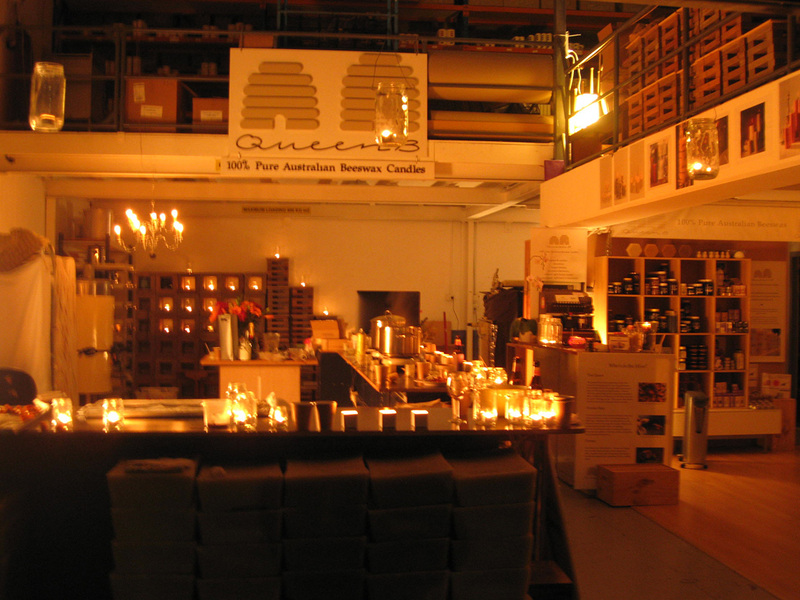 At Queen B we delight in making the world’s purest beeswax candles. Our pure beeswax is carefully sourced from beekeepers we know personally and then cleaned thoroughly over 72 hours. Our wicks are pure cotton and we scour the globe to ensure we are always at the forefront of wick technology. Our range extends from the basics (beeswax tealight candles, beeswax tapers, beeswax dinner candles, beeswax pillar candles), to the innovative (beeswax jam jar tealights, Burning Love, Ecobulb) and through to more designer beeswax candles (our rolled pillar candle ranges). … or things I want to give as gifts that I can’t find anywhere else. Our baby bee suits fit into this category… [not so much something I wanted for myself 🙂 ], I was looking for the perfect, unisex gift for friend’s who’d had babies. Now I’m spoiled for choice! Made from soft knit cotton and soft elastic. Available in sizes 000 (0-3 months) – 2 (12-24 months). Made with the finest quality, super soft leather, with cotton lining, allowing baby’s feet to flex and bend naturally. The soft elasticised back ensures they stay on. The flexible, padded suede sole allows natural movement as if they were barefoot. Available in sizes 0-6mths, 6-12mths, 12-18mths and 18-24mths. I recently received this photograph from a friend I’d given the suit to… makes me smile every time I look at the photo!